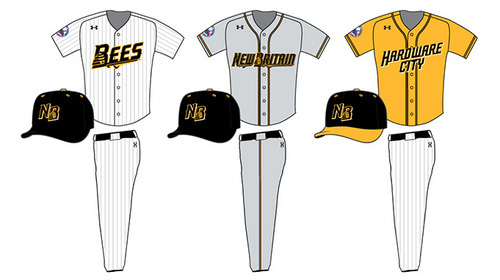 (New Britain, Conn., February 16, 2016) – New Britain Bees team officials today introduced all three uniform jerseys the team will wear during their inaugural 2016 season in Central Connecticut. Each is manufactured by American sports clothing and accessories giant Under Armour. The home jersey is white with black pinstriping with the gold "Bees" wordmark across the chest, the Atlantic League patch on the left sleeve and the iconic "UA" logo on the upper right hand breast. The jersey the Bees will wear on the road has a grey body with gold piping and features the black "New Britain" wordmark on the chest and league logo patch on left sleeve. Finally, the Bees alternate jersey will be gold with the black "Hardware City" wordmark across the chest. The team will wear black belts and socks. The team worked with official Atlantic League partner TGI/Alleson for all on-field and batting practice wear. Skye Design Studios (www.sdsbranding.com), a brand identity and design firm located in the greater New York City area, developed all team logos and lettering. "We're excited with the top level look our team will have on the field," said GM Patrick Day. "The first step in feeling good and playing good is looking good. Our uniforms will not only be able to withstand the rigors of the 140-game Atlantic League season, but also give our players the absolute best product money can buy in pursuit of winning a championship. All new on field merchandise will populate the store on the team's April 21 Opening Day. Fans will have the opportunity to purchase the same shorts, shirts, hoodies, sweats and BP tops the players will be wearing throughout the season. "Our players are going to be proud taking the field in these uniforms," said manager Stan Cliburn. "And I'm sure the fans are going to love wearing the same exact products we are winning on the field in while cheering us on from the stands." The New Britain Bees are a member of the Atlantic League of Professional Baseball and will begin their inaugural season of play at New Britain Stadium on April 21. For further information or to become a season ticket holder, email info@nbbees.com, call 860-826-BEES (2337), or visit NBBees.com.